Mumbai-based Parisar Asha (PA), is among the handful of education-focused non-profits of the 1980’s era who took the initiative to replace the traditional format of education (rote-learning) with an effective learning methodology that is relevant to the real environment surrounding us. PA’s mission is to ignite a spark of curiorsity in every child so that it heightens their awareness of the the importance and relevance of the environment around them. PA’s flagship project ESAL, i.e. Environmental Studies Approach to Learning, revolves around Education through the environment and for the environment. PA is recognised as ‘Re-Imagine Learning Challenge Pacesetter’ by The Lego Foundation and The Ashoka Foundation for its contribution in revolutinizing the education system in India. 14,000+ students benefited from PA’s study material for all subjects in FY13. As of March 2014, 800 schools (both private and public) used PA’s education kit for students from Jr. KG to Grade VII. The content designed by PA has advanced the teaching skills of over 10,000 teachers, which has benefited millions of students across 800+ schools till date. In FY13, 400 teachers across 28 schools of the Municipal Corporation of Greater Mumbai benefited from the soft skills workshop conducted by PA in collaboration with Naandi Foundation. Besides this, PA has conducted several staff enrichment workshops for Corporates, keeping environment conservation at the center of the agenda. TCS, UltraTech, Peacefort, Nokia, Vodafone, Pantaloons and Mahindra & Mahindra are some of PA’s committed corporate clients. 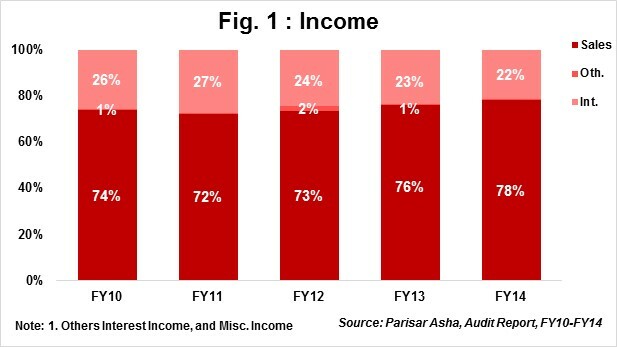 PA posted a total income of Rs15.8mn in FY14; a YoY income growth of 30%. In its initial years, PA received funds from UNICEF, Ratan Tata Trust, Aga Khan Foundation and others to execute its plans. However, over the years, PA has become self sustaining and haven’t raised any funds from donors. PA earns revenue by selling its content material to private and public schools across India and in foreign countries like US, Muscat, Doha and Sri Lanka. Cost of kit per student is Rs1,000 and is offered at a subsidized rate for public schools, if they cannot afford it. Besides income from sale of study material, PA earns income from its Eco-Enrichment programs. These are one-day workshops that focus on individual growth and eco-sensitization. Workshops are conducted in schools, colleges, corporates, clubs and other NGOs. PA’s balance sheet is quite healthy with investments of Rs40mn in FY14. This fetched PA an interest income of Rs3.4mn in FY14, (21% of total income). Interest contributed an average of 24% of total income during FY10-FY14. PA has outsourced the printing contract of its study materials to a third party. 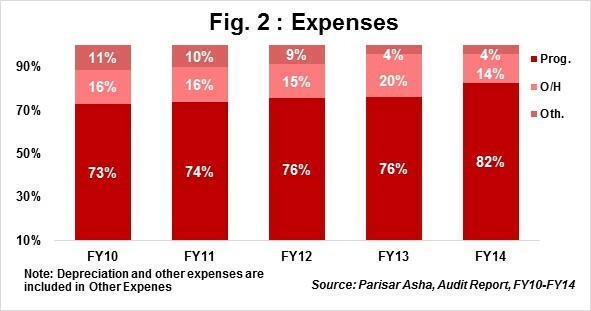 Printing cost for past five years (FY10-FY14) has averaged to 20% of total expenses, whereas 55% of total expenses was paid out as salaries for content development and the enrichment teams for the same period. 83% of total expenses was spent towards the objects of the trust in FY14, which is above PA’s 4-year historical average of 74% (FY10-FY13). 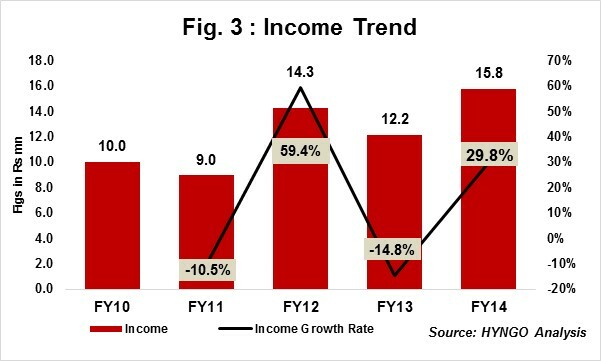 PA’s total income grew at a 5-year CAGR of 16% during FY10-FY14, with sharp fluctations in growth rates witnessed each year. Despite the negative growth rate every alternate year, PA’s model has helped them sustain during this turbulent phase of their journey. Self Sufficiency Ratio (SSR) indicates an organisation’s ability to meet its operating expenses from own income (sale proceeds, service charges, interest income and individual donations) stood at 112% in FY14; marginally lower than the SSR in FY13 i.e. 130%. Some of the Maharastra-based schools who have been using PA’s content for a while now are Utpal Sanghvi School, Bombay Scottish High School, Greenlawns’ High School, St. Andrews High School, St. Anne’s High School, BJPC Instition, Mount Carmel Primary School and Loyala High School. There are several schools who are committed buyers of PA’s study material. Another Mumbai-based non profit, Avehi Public Charitable Trust does similar work like PA, developing content (study material) and attempting to replace rote learning with activity based learning among children. Operating model for both non profits varies. 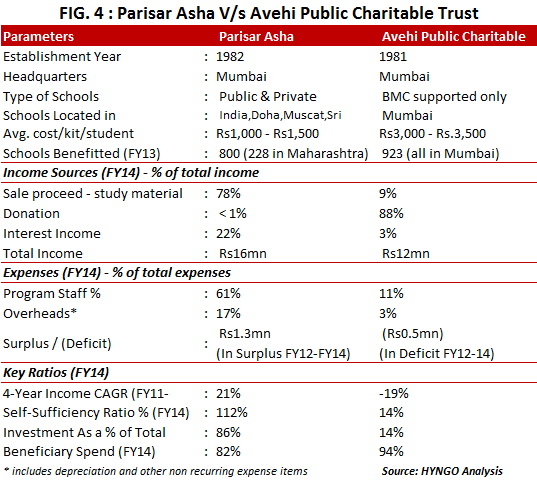 PA’s income is dependent on sale of its content published each year making itself-sustaining; whereas Avehi provides content to BMC schools in Mumbai free of cost and charges a minimal fee to private schools resulting in a weak financial position. PA employs 50 people and all of them are paid salaries on time; whereas on the other hand Avehi has not been able to pay salaries to some employees in the past two years. Another indicator which suggests PA’s strong financial position is the Investment to Asset Ratio. Investments in the form of Fixed Deposits accounted for 86% of PA’s total assets v/s only 14% for Avehi in FY14. Founding member, Late Ms. Gloria de Souza was an educationist and a social worker. She did her specialization in Environmental Education and received several awards for setting up PA. She was the first individual to receive a Fellowship from the ‘Ashoka Innovators for the Public’ in 1982. In her late 70’s, Ms. Gloria de Souza appointed Ms. Aarati Savur as the CEO of PA to minimize the likely effects of Founder’s Syndrome. Ms. Savur worked with PA prior to taking up assignments in the corporate world and her comeback in 2012 resulted in smooth transition after Ms. de Souza’s demise in 2013. The Board comprises of six distinguished personalities from diverse fields like education, journalism, brand management, library management, pharmaceutical research, consultancy and customer relationship management. Two out of six trustees are related to each other. All trustees meet formally once every quarter. However decision making powers are given to the CEO, Ms. Aarti Savur. Ms. Savur initiated the revival of Ujjwal in 2014, PA’s newsletter that details progress made by PA across its various programs.